I read this article and found it very interesting, thought it might be something for you. The article is called March 2015 – Monthly Income Report and is located at http://www.onehourprofessor.com/march-2015-monthly-income-report/. 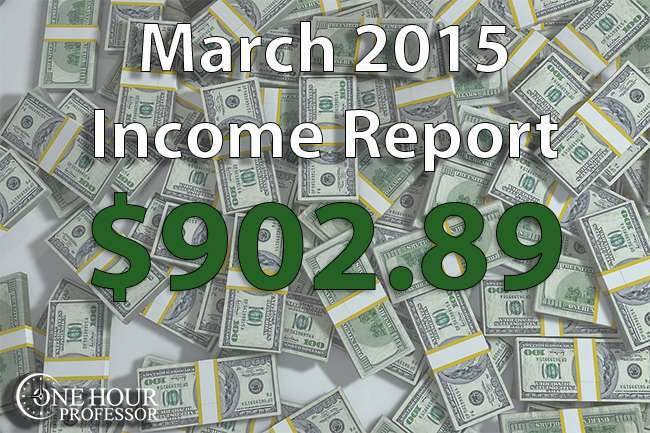 Hello all and thank you for checking out my March 2015 income report. As I mentioned in a very recent blog post, I have officially quit my full-time job and I’m extremely happy to report that this was also the best month for my website income yet. If you want to always see these income reports when they come out (and get some other cool stuff) make sure to sign-up for my email list. There was a significant amount of work done this month, but obviously I had a lot of other things going on. Although this income report captures what was done on the website, it doesn’t capture the fact that I have relocated from my beloved condo to an apartment and spent quite a bit of time contracting for my old employer and a few other clients. This month I was able to create six different blog articles and many of them were really well received by the One Hour Professor audience. Per the usual, I spent time creating an income report for February which, at the time, was my highest grossing month to date. I’ve been able to eclipse that this month, but in my opinion the February income report represents the turning point in my business where I begin to make income every month as opposed to reporting expenses. The next post I wrote illustrates my thoughts around how important it is to diversify your online business. Oftentimes people will find a way to make money on a third-party platform and then focus exclusively on it. While this make sense of first, this post illustrates why you also need to diversify across other platforms to protect yourself. There was also a post about how I am able to write 2000 word blog posts in 30 minutes and I got a lot of email saying “thank you” for this one. I also had a few people email me and ask if I was really able to create so much content in such a short amount of time and I assure you that there is absolutely no hype in that blog post. I share the exact method that I use and explain the tool that makes it all possible. I also had three blog posts that were a result of me noticing a trend in my Google Webmaster Tools account. I outline the exact method that I use to find these types of opportunities in my video quicktip which explains how to use Google Webmaster tools to increase traffic on your website. If you’re wondering how well this tactic works, I’m happy to report that at the time of this writing I am ranking on the first page of Google for all three blog posts that I created. If you want proof, just search any of the following keyword phrases in Google and you’ll see OneHourProfessor.com on the first page. What does labeled for commercial reuse mean? What does labeled for non-commercial reuse mean? I can’t even begin to tell you how great this strategy works if you use it appropriately. In my opinion it’s one of the easiest ways to get traffic to your website and something that is pretty much guaranteed because it’s based on data. Aside from the blog posts I wrote, I spent a significant amount time in March finishing up my new Udemy course (Sign up here to find out when it launches and get a 75% off coupon!) and I’m happy to report that it’s finally done. This is going to be my first Udemy course that I charge money for and I’m really hoping that it goes well. I want to point out that at the time of this writing my free course “How to market your website on the internet” has just over 2,200 students and every single rating has been 5/5 stars so I’m hoping that my paid course will have similar or better results as I put a lot more time into the production of the course. If you’re interested in the free course, make sure to sign-up here to get access. This was by far my greatest month for the blog yet and obviously I’m very encouraged by these results. I’d love to sit here and tell you that all of the income I made was passive, but that wasn’t the case because a lot of the income was a result of consulting agreements. With that being said, the only consulting income that I include in these income reports are directly from people who find my OneHourProfessor.com website and ask me if I’d be willing to do consultations with them. It turns out that consulting (click here if you want to discuss using me as a consultant) is a pretty great gig if you are able to find clients. I’m not going to go into detail of who the consulting clients are, but I will say that at this point in time I’m able to charge $100 per hour to my clients and it’s become pretty lucrative. Obviously I’m not working a full 40 hours per week for these clients, but the hours that I do work are well-paying and also enjoyable as I really love this Internet marketing stuff. One of the arguments that I often hear about consulting is that people say you are trading your “dollars for hours” and while I understand the argument, I also want to mention that if you are good at outsourcing you can hire a virtual assistant to handle many of the mundane tasks that are time-consuming such as research/data collection and pay them a fraction of your hourly rate to do so. In my opinion, this is the definition of working smarter and not harder. As long as you verify all of the data that they send you and confirm that everything is done correctly, it’s a win for yourself, the virtual assistant, and the client because they get the deliverable faster. Aside from my consulting fees, I also got a few referrals from Legal Match which is a service that matches people up with lawyers. These referrals mainly come for my blog post explaining what a website owner should do if they are targeted for a Getty images lawsuit, and it’s one of the few affiliates that I consistently get some income from. You may also notice that in March I brought some income in from my YouTube channel. Personally I was never a big fan of monetizing this channel because I thought that it interfered with the videos itself, but then I realize that I’ve spent a ridiculous amount of time creating these videos and I needed to monetize the channel somehow to get something for the effort. I’ve chosen to only play videos before my current videos on the channel and not have pop ups happen inside of the video itself. Another good thing to report this month is that I saw some income on my Google AdSense account. This is all a result of the 90% outsourced website experiment and although it still isn’t significant, it’s better than nothing. In terms of my expenses this month, there were a few new expenses that popped up, but for the most part it’s similar to what has been spent in the past. AWeber which is still delivering a small amount of revenue each month because of an individual (still not sure who this is) that took my advice and got an AWeber account. However, this tool still costs me some money each month. HostGator as well as HootSuite are two expenses that you should be used to seeing by now. These are going to be monthly recurring costs that I don’t think will be going away anytime soon. One of the new expenses that I’ve taken on which hasn’t shown up in any other of my previous income reports is SEMRush. I specifically purchased this tool because I needed to do a competitive analysis for one of my consulting clients, but I can’t even begin to tell you how great this platform is. Basically with it you are able to see what your competitors are bidding on from a paid search perspective, where they rank in SEO, what their demographics are, and pretty much any other competitive data you’d like to find is available with this tool. This platform is extremely valuable for anybody who has their own website and to see its value I suggest that you do a free search on one of your competitors and you’ll see some of the data that is offered. I’m likely going to do a write-up about this software soon and explain the various ways that I am using it, but it’s easily one of the best pieces of software available to beat your competitors. Another large expense in March was for the Long Tail Pro keyword research tool. Usually this is billed monthly for $17/month, but the company offered to let me purchase the software with unlimited updates for fixed fee of $210. The way I see it, this was well worth the $210 because I have no intention of ever getting rid of this software and it would pay for itself in a year if I purchased it outright. Lastly, I had some more expenses on Elance and those are all related to my most recent Udemy course which focuses on how to use Google Analytics to increase Udemy course sales. The great thing about this is that I no longer have no more development to do for that course and I’m excited to launch it soon. My Udemy course is 100% completed and prepared. I still have to write the course landing page and submit it for approval, but I know that the quality is there and I anticipate that this won’t take me more than an hour to complete. All of the videos for my Udemy course are completed and are extremely high quality. I’m really happy with the way that they turned out and have really lucked out in finding a great video editor who works for about $5 per hour. In total, this person has probably saved me about 100 hours of labor and it’s been the best investment I’ve made. If you’re wondering, I got this editor through Elance. I’m smiling as I write this because I have absolutely crushed my goal to show a profit in March. As I’ve said from the beginning, the goal this website wasn’t to turn a ridiculously large profit, but I also need to make sure that I’m getting paid for all the time that I’m putting into the development of the website itself. This month was excellent and I’m hopeful that April will be just as good or better. I figure while I am setting up this funnel for the launch of my Udemy course, I may as well make a course out of that. I don’t anticipate that this course is going to take a large amount of editing because it’s going to be a lot of raw video of me talking through the marketing strategies that I’m using to have success with my course lunch, but I think it will be very valuable to people. I’m going to challenge myself again this month and make a goal of increasing the amount of profit that I have from last month. I already have a few things in the works and I think that I can do this, but we will see how the month ends up. Do you have any goals for April that you’d like to share below? I’d love to be the one to hold you accountable. I’m excited for you, Ron! This is great news. 🙂 Congrats on a big month!